propylene capacity by 100,000 tonnes to 400,000 tonnes per year. Jacobs Engineering Group Inc. announced today that a subsidiary company received a contract from Borealis to provide engineering, design, and construction management services for a polymer production facility in Burghausen, Germany. Officials did not disclose the contract value for the new facility, which is scheduled for commissioning in 2007. The 330 kton/a facility will use Borealis' proprietary Borstar(R) technology to produce polypropylene. Borealis is Europe's second largest manufacturer of plastics and a global leader in the industry. The Burghausen location is part of the firm's Hub Central Europe, one of four hubs that Borealis operates in Europe. Porvoo　 A fully integrated petrochemical complex located east of Helsinki is concentrating on manufacturing and selling petrochemical products such as olefins (ethylene, propylene and butadiene) phenol and aromates (acetone, benzene and cumene), as well as polyolefins − polypropylene, polyethylene and compounding products. Ronningen The Ronningen site southwest of Oslo produces PE, PP and compounded products. Ethylene and propylene feedstock is provided by a joint venture known as Noretyl. Sweden Stenungsund The site at Stenungsund north of Gothenburg is a fully integrated petrochemical complex. A unimodal PE plant is being upgraded with Borstar technology to a bimodal plant with a capacity of 225 KT annually. Belgium Beringen Borealis Polymers N.V. Located in the north-east of Belgium, this Borealis site produces PE, PP and compounds. Beringen houses technical support units for PP fibre and BOPP film applications, as well as support units for both PE and PP moulding. Borealis in Kallo produces PP includes also NSP Olefins, a former J/V with Shell until December 31, 2002. Borealis has in total a 480,000 t/a of propylene capacity. Zwijndrecht Borealis Antwerpen Compounding N.V.
Zwijndrecht Speciality Polymers Antwerp N.V.
Speciality Polymers Antwerp is a 50-50 joint venture between DuPont and Borealis. The company manufactures polyethylene at a 125.000 tonnes/year high pressure polyethylene plant. Borealis in Burghausen, east of Munich is a part of the "South East Bavarian chemical triangle". It produces both PE and PP. The site is a fully integrated part of Borealis in Austria. The Schwechat site near Vienna airport produces both PE, PP and compounds, and is Borealis' first commercial production site of Borstar PP. The new plant has an annual production capacity of 200 kilotonnes per year (KT/y). Start up was in May 2000. LLDPE capability was set to rise by 350,000 mt/yr at a cost of Eur200-mil. Three existing lines with a total capacity of 200,000 mt/yr were to be mothballed, meaning the net gain in output at the site would be 150,000 mt/yr. The company said capacity of the existing PP plant at the site, Borstar, would rise by 90,000 mt/yr to 300,000 mt/yr. The new capacity was due to come onstream in 2005. Borealis Compounds LLC is a materials specialist with a line for superclean cable insulation products, plus compounding units for other cable materials including carbon-filled semiconductor grades. Borealis-OPP is a joint venture of Borealis (80%) and the Brazilian company Braskem S.A. (20%). The joint venture has taken over OPP’s (now Braskem) current 50,000 tonnes/year (t/a) compounding business and assets in Brazil, and is serving customers in the automotive and home appliances industries in South America. Borealis-OPP has two production sites in Brazil: in Triunfo, with a capacity of 26,000 t/a; and in Itatiba, with a capacity of 24,000 t/a. The J/V employs approximately 130 employees. Borouge (Abu Dhabi Polymers Company Ltd.) is the production company of a joint venture between Borealis and the Abu Dhabi National Oil Company (ADNOC), owned 60% by ADNOC and 40% by Borealis. The construction of the petrochemical complex in Ruwais, United Arab Emirates, was completed December 2001. The site consists of an ethylene-based cracker with an annual output capacity of 600 KT and two polyethylene lines of 225 KT each which utilise Borealis' Borstar PE technology. The complex will have approximately 400 employees. Borealis takes its name from aurora borealis, also known as the northern lights. Borealis' main business is polyethylene (PE) and polypropylene (PP). We are one of the leading producers in Europe and also a significant supplier in key markets around the world. Our head office is in Denmark, just outside Copenhagen. The Borealis Group produces over 3 million tonnes of PE and PP each year, and employs nearly 5,200 people. The output from our main manufacturing sites and compounding units is plastics raw material that can be found in thousands of everyday products from diapers, food packaging and houseware, to cars and trucks, pipes and power cables. Borealis' foundation for growth is Borstar, an innovative technology developed by us which offers PE and PP materials that are stronger and more easily processed than conventional materials. The official start-up of Europe's newest major petrochemicals and polyolefins company, Borealis, took place today. The result of the merger of the petrochemicals and polyolefins businesses of Finland's Neste and Norway's Statoil, Borealis represents the single most important step forward yet in the restructuring of the industry in Europe. Borealis is also the largest industrial merger between Nordic companies to date. Austria/ new polyethylene plant and extra polypropylene capacity for Borealis. Borealis has announced that it is to spend EUR 200 M on extra polyolefins capacity at Schwechat, Austria. A new 350,000 tonnes/y polyethylene plant is due online in 2005, using the Borstar process, enabling 3 older polyethylene production lines to be closed. The capacity of a polypropylene plant on the site is to be increased by 90,000 tonnes/y. As a result of co-operation between Lurgi, Statoil and Borealis, the world’s first Borstar® polypropylene cups have been created using propylene from Lurgi’s new MTP® (Methanol-to-Propylene) process. Scandinavian polyolefin producer, Borealis, would increase its linear low density polyethylene production capacity at its Porvoo facility, Finland, by 80,000 mt/yr, a company source said Tuesday. Borealis will expand its Noretyl ethylene cracker, a 50:50 joint venture with Hydro Polymers at Rafnes with 100,000 tonnes, and debottleneck its own polypropylene plant at Ronningen. The two Norwegian projects will be completed in the autumn of 2005. The annual polypropylene production capacity will increase from 105,000 to 175,000 tonnes. Noretyl AS owns and operates the Ethylene plant (cracker) at Rafnes*. The Ethylene plant started up in 1977. Noretyl AS was established 1. January 2001 and is owned by Hydro and Borealis with 50% each. The owners are responsible for providing feedstock and selling products. The mainproducts are used as raw materials in the owners production of VCM, polyethylene and polypropylene. Repsol YPF announced that its Chemicals Division has signed an agreement with Borealis A/S to purchase Borealis Polimeros Lda. that includes all assets of the petrochemical complex at Sines, Portugal. The completion of the transaction is subject to authorisation by the European Commission. Based on 2003 capacities, the site comprises a cracker with a volume of approximately 350,000 tonnes of ethylene and 180,000 tonnes of propylene and two polyethylene plants, a low density plant with a production capacity of 145,000 tonnes and a high density plant of 130,000 tonnes. This agreement strengthens Repsol YPF’s strategic lines and allows for new development in two core businesses, olefins/base petrochemicals and polyolefins. This purchase gives Repsol YPF stronger presence in European markets and complements its product portfolio with new applications currently not manufactured at the Puertollano and Tarragona complexes in Spain. The implication of this deal is a 38% increase in Repsol YPF’s cracker production capacity. In addition, it means a 28% increase in production capacity in total polyolefins and a 55% increase in polyethylene. Borealis is a leading, innovative provider of plastics solutions with main production sites in Europe and the Middle East. John Taylor, Borealis’ Chief Executive, commented that, “This divestment will allow us to concentrate on our four major European sites: Austria, Belgium, Finland and Scandinavia, thus strengthening competitiveness and sustaining future growth.” Iberia remains an important market for Borealis and it will maintain its Customer Service Centre in Barcelona. This agreement is in line with both companies’ strategies, enhancing competitiveness and improving efficiency, in a challenging plastics industry environment. Data refers to end 2003 capacity to align with EU commission submission. Figures not updated for expected 2004 changes. Borealis, Europe’s leading producer of polyolefins plastics, today announced plans to acquire PCD of Austria. According to the memorandum of understanding, Borealis will acquire PCD from its current owner, OMV, as of January 1, 1998. The acquisition is related to another move announced today regarding the future ownership structure of Borealis. Neste has disclosed plans to sell its 50% shareholding in Borealis to International Petroleum Investment Company (IPIC) of Abu Dhabi, and OMV, the integrated Austrian oil and gas company. IPIC and OMV will each have a 25% shareholding; Statoil will retain its 50% shareholding. With some 1,000 employees, PCD produces approximately 445,000 t/a of polyethylene and 410,000 t/a of polypropylene at sites in Austria and Germany. IPIC was created in 1984 as a 50-50 venture between ADIA and the Abu Dhabi National Oil Co. (ADNOC) to focus on oil-related acquisitions overseas. ADIA：Jointly owned by the Abu Dhabi Investment Authority (ADIA) and the National Bank of Abu Dhabi (NBAD) , the company is now one of the leading Gulf based financial institutions. The International Petroleum Investment Company (IPIC) of Abu Dhabi and OMV Aktiengesellschaft of Austria have announced today their agreement to purchase Statoil’s 50% shareholding in Borealis A/S. As a result, the new Borealis ownership will be 65% IPIC and 35% OMV. Statoil will continue as a major long-term feedstock supplier to Borealis. 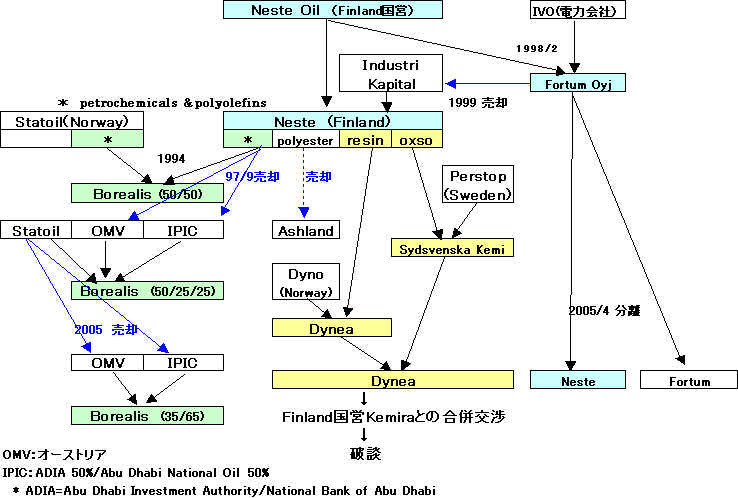 Borealis is also joint owner with the Abu Dhabi National Oil Company of the Borouge polyolefins company in Abu Dhabi. Coincidentally Borealis has anounced a Eur 36 million investment at its Porvoo site in Finland where ethylene capacity will increase from 330,000 to 380,000 tonnes and propylene from 200,000 to 223,000 tonnes in 2007. Statoil ASA has closed the sale of its 50 per cent holding in the Borealis petrochemicals group. Statoil has received EUR 1 billion (NOK 7.8 billion) for the transaction which gives a book profit of NOK 1.5 billion. The buyers, International Petroleum Investment Company (IPIC) and OMV Aktiengesellschaft, which earlier together owned 50 per cent of the petrochemicals group, now own 65 per cent and 35 per cent respectively. Statoil has long-term agreements to supply Borealis with feedstock from the Norwegian continental shelf. Borealis today confirmed that its 110,000 tonnes HDPE plant at Bamble in Norway will close later this year, as expected from the company's announcement at the beginning of February. Around 100 employees will be affected by the closure. OMV, Central Europe's leading oil and gas group, continues to focus on its core business: Exploration & Production, Refineries & Marketing and Gas. In this context OMV, together with its core shareholder IPIC, is planning on incorporating AMI Agrolinz Melamine International GmbH (AMI), one of the leading producers internationally of melamine and plant nutrients, into Borealis. OMV and IPIC each hold 50% of AMI. The final decision will be made in the course of the first half of 2007. Borealis is Europe's second largest producer of plastics and is headquartered in Vienna. As a holding company, Borealis will provide excellent support for AMI's further international expansion. AMI's headquarters will remain in Linz (Upper Austria). For OMV this has the advantage that its strategic focus on its core business will be further strengthened, while at the same time OMV will profit from the growing plastics market enhanced by the assets of AMI via its investment in Borealis. Overall, this measure constitutes the last step in AMI's strategic repositioning, which started in May 2005 with IPIC's acquisition of 50% of the company. The establishment of a production facility for melamine in Ruwais- also located in Abu Dhabi - is being pursued by AMI and ADNOC. This site will have an annual capacity of 80,000 tons. In 2005 the AMI Group had a workforce of around 1,000 and sales of EUR 470 million. Borealis had sales of EUR 4.8 bn and a workforce of 4,543. AMI Agrolinz Melamine International GmbH is a 50% owned OMV and IPIC (International Petroleum Investment Company) subsidiary, which upgrades natural gas into high-value agricultural and industrial raw materials. The company's main products are melamine and plant nutrients. In the melamine sector, AMI is the market leader in Europe and the global number two. It also occupies a leading ranking in the plant nutrients market in the Danube region. The AMI Group consists of the core companies AMI Agrolinz Melamine International GmbH, located in Linz (A), the fully owned subsidiary Agrolinz Melamine International Italia S.r.l., based in Castellanza (I), the Agrolinz Melamine International Deutschland GmbH located in Piesteritz / Saxony-Anhalt and the Trading Company for fertilizers LINZER AGRO TRADE GmbH, sales companies in Hungary, the Czech Republic and Slovakia, as well as the sales companies Agrolinz Melamine International North America Inc., Chicago, USA and Agrolinz Melamine International Asia Pacific Pte Ltd., Singapore. The AMI Agrolinz Melamine International Group has a workforce of around 1,000 and sales of EUR 394 million. in May 2005 with IPIC's acquisition of 50% of the company. Everything started with nitric acid ! Linz has been a location for large-scale, industrial chemicals production for 60 years. The beginning was formed by Stickstoffwerke Ostmark AG (renamed in 1946 as Osterreichische Stickstoffwerke AG and in 1973 as Chemie Linz AG), which utilized the coke oven gas produced by the neighboring "Reichswerken Hermann Goring" iron and steel plant. During the post-war economic boom, the plant gradually expanded its production. Fertilizer production developed into Agro-Chemie, which manufactured a wide range of agricultural pesticides, growth regulators and animal feed additives. Using nitrogen as a basis, Chemie Linz AG extended its program to include acrylonitrile, urea and melamine, for which a new and highly attractive process was created. Furthermore, the Linz chemical industry attained an international standing in the area of organic chemicals. Pharmaceuticals also have long traditions in Linz. Apart from an extensive program of medicines, Chemie Linz AG developed an international business with active substances, intermediate products and fine chemicals. Research and development was and is the core of company activities. In addition, application technology, project planning and realization, as well as certain engineering services are provided in the Linz Chemiepark. The result is a pool of experience and know-how, which now extends from basic products to performance chemicals. Specialization and a concentration on core business are modern business maxims, which in combination with intensified competition have given the Upper Austrian chemicals industry location a completely new face. The Chemiepark has evolved from the multi-divisional Chemie Linz AG and now provides a home to around 40 companies, which take full advantage of the location synergies. Borealis, a leading provider of innovative, value creating plastics solutions, will invest EUR 25 million to expand the capacity of its PP plant in Porvoo, Finland, by 65,000 tonnes per annum (tpa) to 220,000 tpa by the end of 2008. The increased capacity will meet rapidly growing customer demand for innovative plastics solutions in the pipe and advanced packaging markets and better supply the developing Russian market. The remaining Eur65 million would be spent on the extension of its product range at its units at Schwechat, Austria with a combined capacity of 435,000 mt/year. Borealis recently announced that it is expanding its plant at Burghausen in Germany to manufacture 330,000 tpa Borstar(R) PP. Borealis, a leading provider of innovative, value creating plastics solutions, will invest EUR 370 million in Stenungsund, Sweden, enhancing its capability to provide advanced materials for the growing wire and cable market, as well as for the Nordic packaging market. The total polyethylene capacity at Stenungsund will increase from 580,000 t/y to 700,000 t/y, making it a leading world-scale facility for advanced infrastructure applications. The HDPE plant in Norway is one of three production units in Bamble, 160 kilometers southwest of Oslo. The plant started up in 1979 with a capacity of 50,000 tonnes per year and after several debottleneckings, the capacity is today 110,000 tonnes per year. The main products are in the areas of blow moulding and rotomoulding e.g. materials for bottles and leisure boats. The acquisition of Borealis AS follows the recent announcement made by INEOS Capital, to buy Norsk Hydro ASA's polymers business (Kerling) and completes the total purchase of the Noretyl cracker, a 50:50 Joint Venture between Norsk Hydro and Borealis AS. The opportunity to purchase both shareholding interests in the Noretyl cracker presents INEOS with unique benefits by bringing the businesses at Rafnes under a single ownership. The acquisition of Borealis AS provides a complementary fit with its existing Olefins and Polyolefins portfolios, technology and expertise. It also improves integration into key feedstocks allowing the company to optimise across its existing assets in Scotland (Grangemouth), Benelux (Antwerp, Lillo and Geel), Germany (Köln and Wilhelmshaven) and France (Lavéra) giving INEOS an extended geographic reach in European Markets. Borealis AG has selected LyondellBasell’s Lupotech T technology for a new 350 KT per year low density polyethylene (LDPE) plant; start-up is expected in 2013. The location has yet to be decided. It is the second LyondellBasell license taken by Borealis in the past three years. W.R.Grace & Co. today announced a new multi-year agreement to supply polypropylene catalysts to Borealis AG, a leading provider of chemical and innovative plastics solutions. Financial terms were not disclosed. The catalysts are used in the production of polypropylene, a plastic polymer that is a versatile substitute for wood, metal, glass and other plastics. Grace polypropylene catalysts are used to make specialty plastics for applications in automobile parts, household appliances and consumer product packaging. "This agreement is a reflection of our ongoing strategic direction to expand into the polypropylene catalyst segment through greater collaboration with a technology leader," remarked Tony Dondero, Vice President and General Manager of Grace Davison Specialty Catalysts and Process Technologies. "We are working together to meet the growing demands for this versatile polymer." "Borealis is an established industry innovator and we are extremely pleased to continue to expand our relationship," commented Greg Poling, Vice President of W. R. Grace & Co. and President of Grace Davison. "We look forward to developing new and next generation catalyst technologies and greater manufacturing capabilities with them." Grace and Borealis have worked together for many years. In 2002, Grace acquired Borealis catalyst manufacturing assets, including catalyst production facilities in Stenungsund, Sweden and catalyst manufacturing equipment located in Porvoo, Finland. Through that transaction and a related licensing agreement, Grace began to produce, market and sell Borealis' proprietary catalysts on a global basis. Borealis is a leading provider of chemical and innovative plastics solutions that create value for society. With sales of EUR 4.7 billion in 2009, customers in over 120 countries, and 5,200 employees worldwide, Borealis is owned 64% by the International Petroleum Investment Company (IPIC) of Abu Dhabi and 36% by OMV, the leading energy group in the European growth belt. Borealis is headquartered in Vienna, Austria, and has production locations, innovation centers and customer service centers across Europe and the Americas. Through Borouge, a joint venture between Borealis and the Abu Dhabi National Oil Company (ADNOC), one of the world's major oil companies, the company's footprint reaches out to the Middle East, Asia Pacific, the Indian sub-continent and Africa. Established in 1998, Borouge employs approximately 1,400 people, has customers in more than 50 countries and its headquarters are in Abu Dhabi in the UAE and Singapore. Today Borealis and Borouge manufacture 4.4 million tonnes of polyolefins (polyethylene and polypropylene) per year. For more information visit: www.borealisgroup.com and www.borouge.com. Grace is a leading global supplier of catalysts and other products to petroleum refiners; catalysts for the manufacture of plastics; silica-based engineered and specialty materials for a wide range of industrial applications; sealants and coatings for food and beverage packaging, and specialty chemicals, additives and building materials for commercial and residential construction. Founded in 1854, Grace has operations in over 40 countries. For more information, visit Grace's web site at www.grace.com. Grace has two operating segments, Grace Davison that provides specialty chemicals, materials and formulation technologies, and Grace Construction Products that produces specialty construction materials, systems and services that strengthen, enhance and protect structures. Borealis, a leading provider of innovative solutions in the fields of polyolefins, base chemicals and fertilizers, together with First Energy Bank of Bahrain, announced today that they have formed a joint venture in Bulgaria called FEBORAN AD. On December 21, 2013, FEBORAN purchased 20.3% of the shares of Neochim AD, a company listed on the Sofia stock exchange. First Energy Bank B.S.C. (c) (FEB) is an Islamic investment bank licensed by the Central Bank of Bahrain and headquartered in Manama, Kingdom of Bahrain. The Bank focuses on investments in the production, transportation, storage and refining of hydrocarbons, as well as oilfield services and energy sector technologies. FEB also explores new opportunities to invest in the development of power generation capacity and renewable energy technologies. Borealis, a leading provider of innovative solutions in the fields of polyolefins, base chemicals and fertilizers, has signed a 10-year agreement with Antero Resources to supply ethane from the United States for its flexible steam cracker in Stenungsund, Sweden. The project also includes a shipping agreement with Navigator Holdings and a related multi-million investment in an upgrade of the cracker and the construction of an ethane storage tank. The ethane supplied from the US complements the recently signed ethane supply contract with Statoil providing Borealis with an alternative attractive source of feedstock for its petrochemical plant in Sweden. Antero Resources will supply ethane originating from the Marcellus and Utica shale formations to Borealis in Stenungsund. The company has signed parallel fractionation, pipeline and terminal service contracts to enable free on board (FOB) delivery at the Marcus Hook terminal operated by Sunoco Logistics. The first delivery of ethane is planned for late 2016. A related long-term shipping agreement has been signed with US-listed Navigator Holdings, one of the largest owners and operators within the handysize liquefied gas carrier segment. For this purpose, Navigator will build a new, 35000 cbm state-of-the-art ethane vessel equipped with dual fuel engines. The vessel will be among the most modern in the world and will ensure cost effective, safe and reliable transport of ethane to Stenungsund. The ethane supply coming to Stenungsund by ship will be stored in a purpose-built, fully refrigerated ethane tank. A lump-sum turnkey agreement has been signed with TGE Gas Engineering GmbH to construct the tank. In parallel, Borealis will also upgrade its steam cracker to enable increased ethane cracking. Borealis' cracker in Stenungsund is one of the most feedstock-flexible crackers in Europe. In addition to ethane, it can also crack naphtha, propane and butane. Stenungsund has significant liquefied petroleum gas (LPG) storage capacity, allowing the company to source LPG from various sources with vessel sizes ranging up to very large gas carriers. "We need to take advantage of the significant shift in ethane availability triggered by the US shale gas boom," says Mark Garrett, Borealis Chief Executive. "In an increasingly challenging environment in Europe this is an exciting opportunity to increase the competitiveness of our integrated polyolefins business." "The ethane contract with Antero Resources in combination with the recently renewed North Sea-based ethane contract with Statoil provides us with an ideal portfolio of sources balancing cost competitiveness and supply security," comments Markku Korvenranta, Borealis Executive Vice President Base Chemicals. "This contract and the related investments underline our commitment to further strengthen our monomer position in Europe." Borealis' Polyolefins capabilities position the company among the leading and most innovative suppliers to the polyethylene (PE) and polypropylene (PP) market in Europe. Borealis acquired full ownership of Speciality Polymers Antwerp N.V.
Borealis, a leading provider in the fields of polyolefins, base chemicals and fertilizers, announced today that it has completed the acquisition of DuPont Holding Netherland B.V. shares of Speciality Polymers Antwerp N.V. Previously, Speciality Polymers Antwerp N.V., located in Zwijndrecht (Antwerp, Belgium) was a joint venture between DuPont Holding Netherlands B.V. (67%), Borealis Polymers N.V. and Borealis Kallo N.V. (together 33%). Borealis, a leading polyolefin plastics producer, and DuPont have launched a manufacturing joint venture — Speciality Polymers Antwerp N.V. — in Zwijndrecht, Belgium, to manufacture high-pressure copolymers. Terms were not disclosed. DuPont also acquires Borealis' current "Borflex" ethylene acrylate copolymer business and related technology. Borealis retains technology rights for its wire and cable compounds business. "The joint venture and the Borflex business deliver quick growth and diversification of our ethylene copolymers in the European region," says Jerome Smith, president of DuPont Packaging and Industrial Polymers (P&IP). The investment demonstrates DuPont's intent to further develop the European ethylene copolymers market and to increase the company's regional production capacity, according to David McFall, P&IP's business director for Europe. DuPont's investment will include further development of ethylene vinyl acetate (EVA) and ethylene acrylate copolymer technology at the joint venture site to complement other strategic ethylene copolymer expansions and technology investments in North America and other regions. From Borealis' standpoint, partnering with DuPont will help quicken realization of Borflex product potential in the marketplace, according to Staffan Lennstrom, executive vice president, Borealis Performance Products Division. The existing Zwijndrecht manufacturing workforce now operates the facility as employees of Speciality Polymers Antwerp. The site's customers will be served by existing Borealis and DuPont marketing organizations. United Chemical Company is the state-owned company in Kazakhstan established in 2009. Simultaneously, a government support agreement was signed between the two companies and Samruk-Kazyna Chief Executive Akhmetzhan Yessimov as well as the government of the Republic of Kazakhstan, represented by the Minister of Energy, Mr. Kanat Bozumbayev. A Memorandum of Understanding (MoU) was also signed to cooperate on a 500 ktpa polypropylene project that is currently being implemented by Samruk-Kazyna Sovereign Wealth Fund and is under construction. The agreements were ceremoniously signed in Abu Dhabi on 24 March 2018 by the Ministers of Energy of Kazakhstan and of the UAE, in the presence of the President of Kazakhstan, H.E. Nursultan Nazarbayev and the Crown Prince of Abu Dhabi, H.H. Mohammed bin Zayed bin Sultan Al-Nahyan. The companies, represented by Mark Garrett, Borealis Chief Executive and by Zhenis Osserbay, UCC Chief Executive, then also signed the agreements. The signing of the JDA comes after the successful conclusion of a pre-feasibility study. The project will now move into the feasibility study phase, which is expected to run until Q1 2019. After the successful completion of the feasibility study confirming the attractive project parameters, a local JV with UCC will be set up*. The scope of the JDA will include the construction of an ethane cracker and 2 Borstar® PE units, with a total capacity of 1.250 ktpa and with a pre-investment in the cracker for future expansion. The final investment decision on the project is expected to be taken in 2020 and start-up would be scheduled for 2025. Through this strategic partnership, Borealis and UCC are exploring the opportunities of jointly developing the Kazakhstan polyolefin industry. “The project is well aligned with the country’s strategy to develop its petrochemical industry and would serve as a strong basis for establishing Kazakhstan on the global polyolefin market,” said Samruk-Kazyna Chief Executive Akhmetzhan Yessimov. “This project would significantly strengthen Borealis’ position in the CIS markets; adjacent to our home market, with growth rates above WE and significant potential for development of advanced PE business based on our Borstar technology,” said Borealis Chief Executive Mark Garrett. Borealis, a leading provider of innovative solutions in the fields of polyolefins, base chemicals and fertilizers, announces that it has confirmed majority funding for Project STOP Ocean Plastics (STOP). Project STOP is a joint initiative with SYSTEMIQ and Sustainable Waste Indonesia. It works with city governments to eliminate leakage of plastics into the ocean, increase plastics recycling and support the wider system changes required for a plastics circular economy. The funding secures the start of Project STOP’s second phase. Phase one of Project STOP resulted in the successful completion of feasibility and baseline studies and other preparatory work. Phase two will see the establishment of the first city partnership, in Indonesia. In common with other South East Asian countries, Indonesia’s economic growth and plastics consumption has outpaced its ability to manage plastic waste. This has made Indonesia the world’s second largest source of marine plastic debris, after China. The first city-partnership project will take place in Muncar, a major fishing port in East Java suffering from plastic litter in its harbour, beaches and rivers. "The next phase of Project STOP is a major milestone in our efforts to keep plastics out of the ocean,” explains Martin Stuchtey, Founder and Managing Partner of SYSTEMIQ. “There is a great need to accelerate circular waste management solutions in Asia and we are hugely excited to design and deliver this new city partnership model, together with Borealis and our government partners in Indonesia." SYSTEMIQ is a different kind of company. We connect people, ideas, technologies, and capital to create good disruptions in critical economic systems. These disruptions are vital for humanity and our planet: they also open up immense opportunities for the businesses that drive them. We need to transform economic systems much faster to hit the UN targets and stop degrading natural resources. Borealis’ owners, which include an Abu Dhabi state investment fund, have given the investment the go-ahead. This is one of the biggest investments in the European chemical sector in the last 20 years. The investment means Belgium can once again compete with the United States and the Middle East, where other big petrochemical complexes have developed. This has been caused by local economic growth and the shale gas boom. “The growth in investment in the European chemical sector has been slower than in other areas, but you have to remember that Antwerp calls itself the locomotive of Europe”, says Thomas Van Velde, who is piloting the project at Borealis. “People will talk about this project. It will put Antwerp on the world map”, says Franck Beckx, the delegate-administrator of the professional chemical sector association essenscia. The new installation – which will be built at Kallo (southern part of the Escaut estuary) - should produce around 1 million tonnes of propylene a year. Propylene is used to make many other chemical products, which opens the door for more investment in the region. “This factory is the first link in a valuable chain. Without it, the chain will start elsewhere. Right now, there’s a big chance it could be constructed here”, says Thomas Van Velde. The factory is due to open in 2022 and create around 100 jobs. It is also expected to create jobs indirectly.